In the summer of 2017, I visited the Camargue in France. 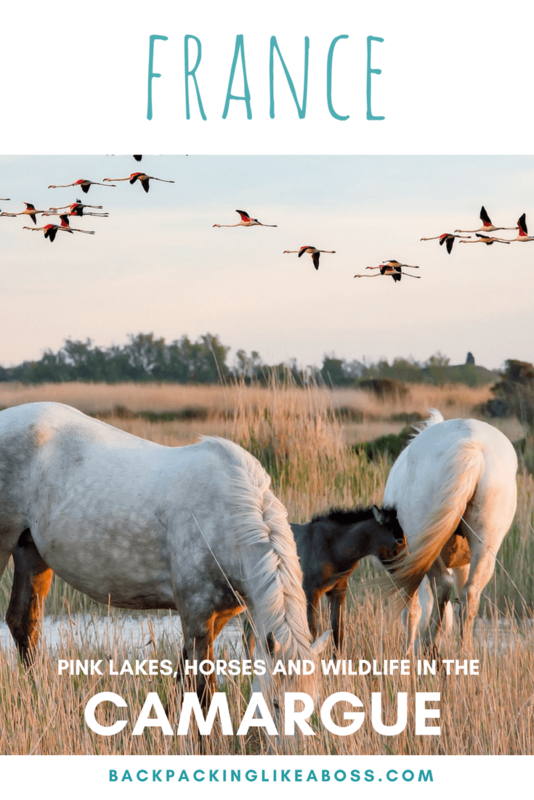 For some reason, the land of the white Camargue horses had always been on my wishlist and now I had the chance 😀 I visited the Camargue with my campervan and got to explore the area quite well! One of France’s most distinctive geographical areas is found in the Camargue. This flat wetland area is one of Europe’s largest wetlands areas. The Camargue is a protected area with hundreds species of birds, white Camargue horses, black bulls, rice paddies and salt flats. 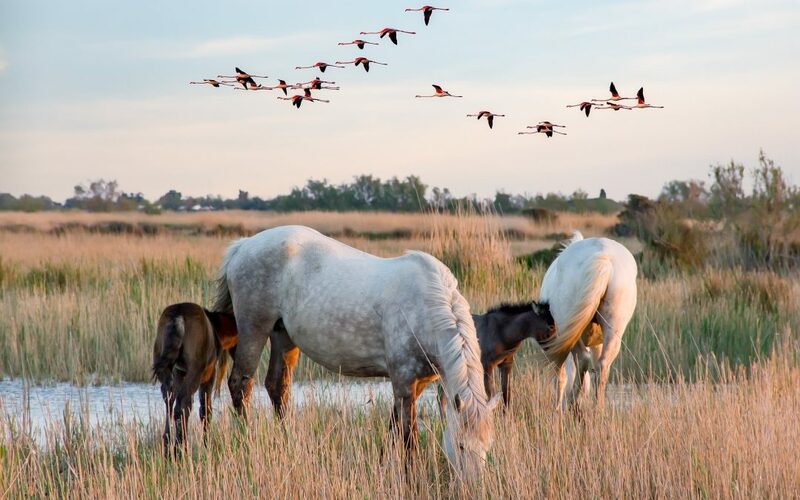 Located on the Mediterranean coast and very close to Arles, the Camargue became a regional park in 1970. 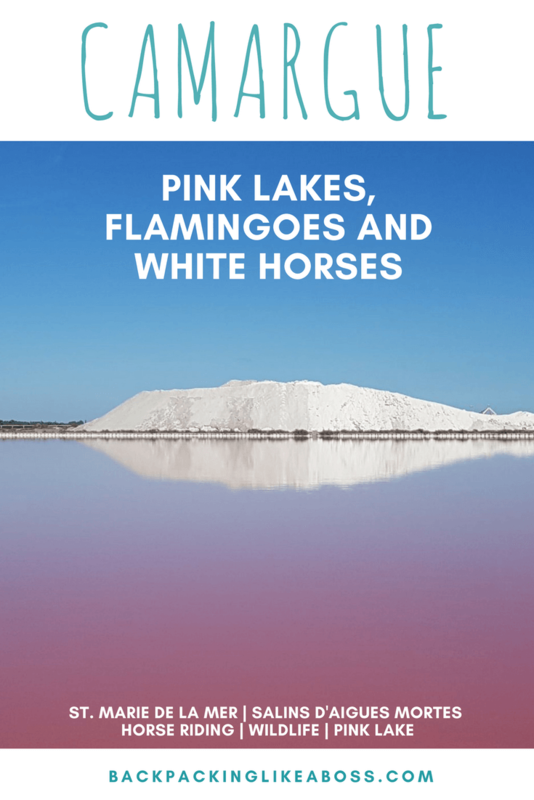 The main town of the Camargue is St. Marie de La Mer, but also the town of Aigues Mortes with its salt flats and pink lake attracts a lot of visitors in summer. You can go to the Camargue any time of year to explore the area. In spring and autumn, the Camargue is an especially interesting area because hundreds of thousands birds migrate via here. In summer, the various beaches of the Camargue are very popular. Of course you have the beach at St. Marie de La Mer, but the beaches of Piemanos and Beauduc Beach are more geared towards the adventure seekers. 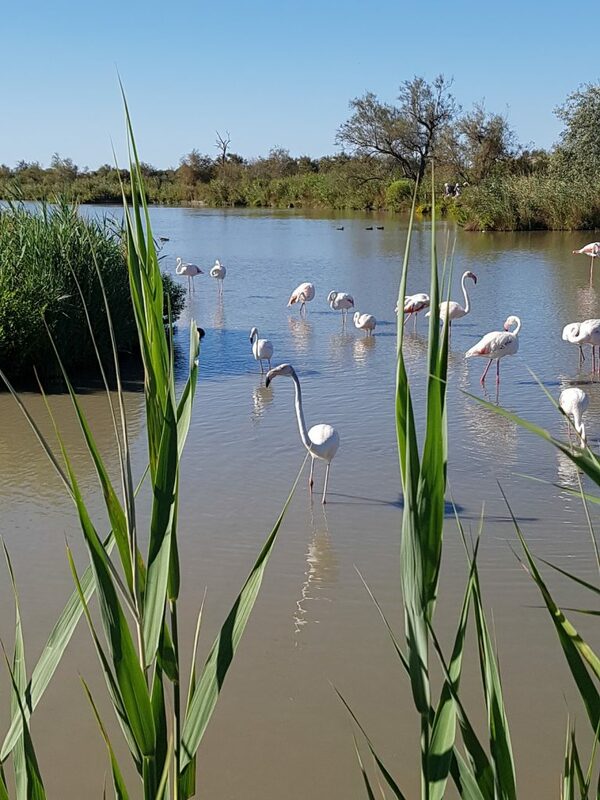 Although humans have lived in the Camargue for ages and have affected it with agriculture, salt pans and rice paddies, there is still lots of nature to explore. If you want to know more about the Camargue and its history, you can also visit the Camargue museum in the middle of the park. The white breed of horses you find in the Camargue are simply called Camargue horses, or Camarguais. They are one of the oldest horse breeds in the world and accustomed to the harsh conditions of the Camargue. The cowboys of the Camargue traditionally use the horses to herd the black bulls. The horses are in general calm and because of their intelligence, they are very useful for this purpose. The Camargue horses seem to have been white forever, but they are actually born with a dark colour. Their skin then turns grey, and the white hairs make them look like white horses. 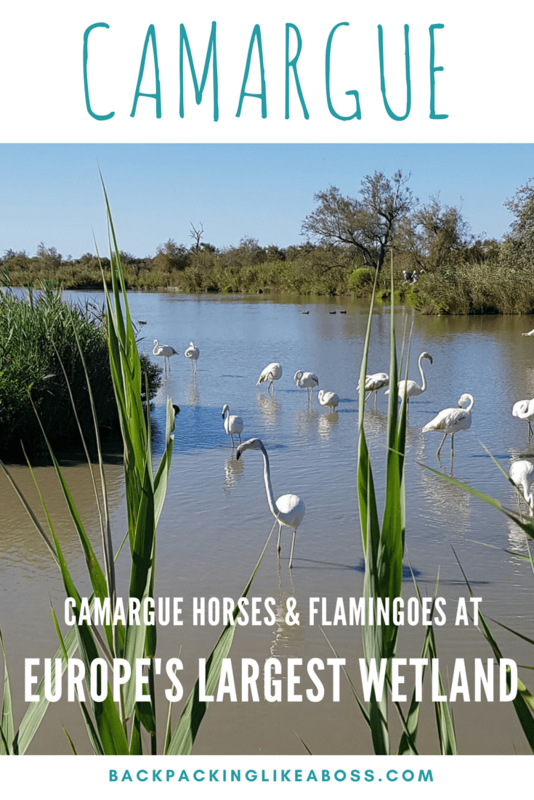 You can see and ride the Camargue horses at different horse riding stables, or in the (semi-) wild in for example the Parc Ornithologique. To get up close with the Camargue horses (the number 1 reason I came to the Camargue! ), I decided to stay at the Manade des Baumelles. 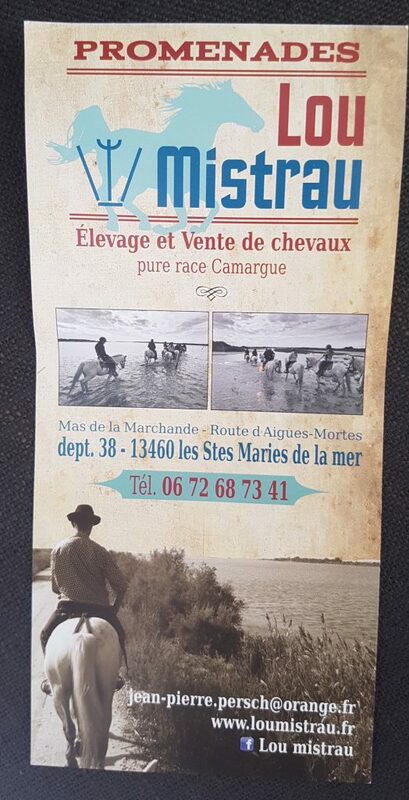 They also had a campervan area – see the section on “Staying in the Camargue” below – which was obviously very useful 🙂 I arranged a 2 hr horse riding trip. The horse riding company linked to the Manade is Lou Mistrau. They offered 3 rides a day in summer, for about €30 per person! I was the only person on the trip and the girl that guided my trip was very capable and fun. The horses do attempt to eat anytime they can, so you have to keep watching them all the time 😀 My horse managed to get his head to the grass a couple of times to snack though! There was some trotting and galopping involved, but most of the trail was not suitable for this. The highlight of the trip was the walk through the water. One of the grass parts was all under water and we went in with the horses. This was a really cool experience! I had a really good time, but to see the horses more in their natural environment, I went to the Parc Ornithologique. To explore more of the wildlife, I visited the Parc Ornithologique, which was a great trip! You can walk the different trails in the park, which will lead you to see many different animals. For me, the flamingoes were the absolute highlight of the park. It was quite hard to get up close because the animals are quite shy. So my smartphone pics were not that great, but with a good camera it’s totally possible to take some great pictures! There were plenty of people in the park, but it didn’t feel too crowded! The short walk has a lot of families and birdwatchers on it, while the longer walk is a lot more quiet. On the short walk you can already see lots of flamingoes and I also saw a beaver swimming along! The longer walk is where you can also see the horses. The Salins d’Aigues-Mortes, or the pink salt lakes, are a remarkable feature of the Camargue. Southern France has been known for producing superior salt since the 1850’s. 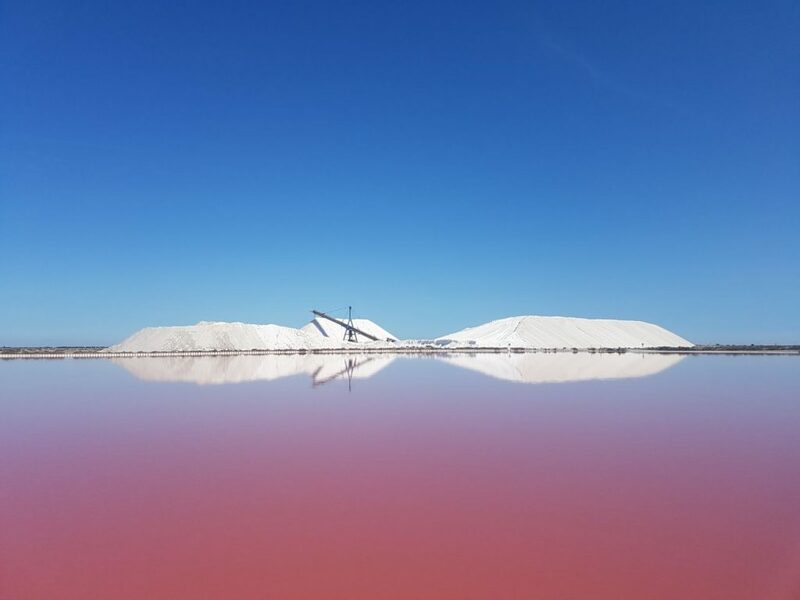 And even better: visitors are invited to see the vibrant pink salt lakes in the area. These salt lakes produce over 500,000 tons of salt each year. When I was there, the only way to discover the salt flats was taking the tourist train. The trip in the train felt like the biggest waste of time in my life 🙂 The talk was only in French, the little train was super uncomfortable, you couldn’t get out anywhere to take proper pictures. However, you do get to see awesome pink lakes and if you speak French, you even may learn something 😉 . If you manage to sneak around a bit at the few places it stops, you may get a good, undisturbed view to take pictures! The train tour costs around €10 for adults and the trains depart about every hour. These days, it seems that there are more options to visit the area. There are now tours offered by foot, by your own bike or by mountainbike 🙂 . I guess this would be a much better option than the train! The nearby fortified village of Aigues Mortes is a historic attraction built to cater to the needs of the people working in the salt industry. The picturesque medieval streets are best explored by foot, and there are many charming shops in the area to visit. As I came to the Camargue with my self-converted campervan, I looked for a place where I could stay for free. I found a great free camping spot via France Passion, a network of farmers, wineries and more for self-sufficient camping cars where you can stay for free. I ended up at Manade Des Baumelles, a bull ranch only a few kilometers rom St. Marie de la Mer. There was a specified space for people coming from France Passion and there were about 10 campers at that moment. There are also some paid motorhome spots in the area in the Camargue which seem good value. The area of the Manade was quite pretty! The building itself contained a restaurant and several halls for banquets and parties. Outside, there was an area for the horses and a place with picknick tables where you could hang out. It was allowed to use the toilets in the building, so that was great! In general, it is quite easy to find accommodation in the Camargue, but in summer you should really book ahead. Booking.com and Airbnb are obvious choices, but I am sure this page of the St. Marie de La Mer tourist office also can provide you with great insights in more cool types accommodations. There are only a few access roads that lead to the Camargue. The most efficient way to get to the Grand Camargue is to drive from Arles on the D570 which leads you to Saintes-Marie-de-la-Mer, one of the only two towns on the Camargue. The other town, Aigues-Mortes as well as the Petite Camargue, is accessible from Montepellier through the Lunel, or driving from Nîmes through the Saint-Gilles. If you want to come by public transport, the closest train station to the Camargue ends in Arles, and there are no train stations in the area. There are a few bus connections to the area; one is the bus line 20 that takes you from Arles to Saintes-Marie-de-la-Mer. The other choice is a bus that departs from Nîmes and takes you to Aigues-Mortes. Despite the traffic, cycling to and within the Camargue is another popular option. Many of the Camargue’s best tourist attractions can also be explored by cycling around. If you intend to visit the coastal areas, a VTT (vélo tout terrain) is recommended. VTT’s are the French version of all-terrain bikes. But I also used my roadbike to cycle from the Manade to St. Marie de La Mer and the Parc Ornithologique, and this worked out fine! Avid hikers will enjoy the scenic GR700 242km trail as an adventurous way of reaching the Camargue. The Chemin de Régordane or Route de Saint-Gilles trail starts in Le Puy-en-Velay and ends in Saint-Gilles, another 26km trek away from Aigues-Mortes. Unless you love cycling, I recommend to explore the Camargue by car. Generally, the roads are a pleasure to drive. 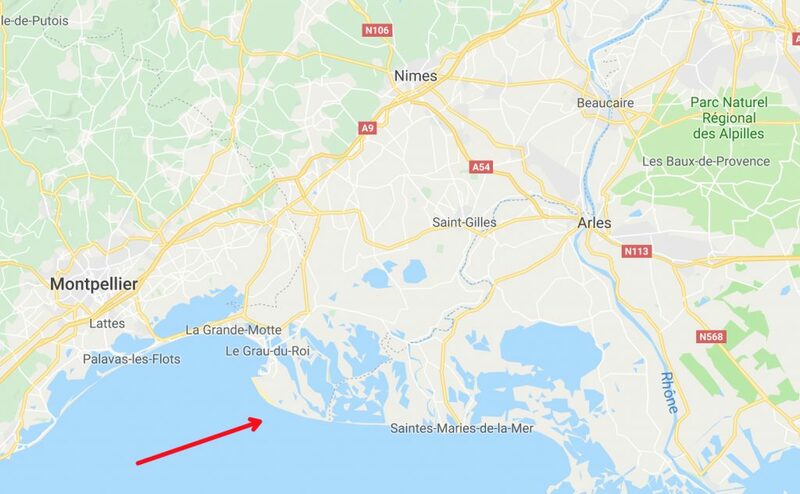 But beware, Aigues-Mortes and Saintes-Marie-de-la-Mer can get busy especially during peak seasons. Aigues-Mortes is pedestrian friendly, so exploring the walled city by foot is easy.